Here’s the state of the projects report! We haven’t reached my goal of 30 by a long shot, but we have found some things that work and some that haven’t. 1. I’m planning to offer home delivery of produce and eggs. 2. We plan to continue to going to farmer’s markets. 3. We’d like to establish our own roadside stand. 4. I’m exploring the idea of providing a welcome service for this area. We’d like to produce pastured turkeys, chickens and rabbits for meat sales, but we haven’t quite figured out the logistics of pasture areas and butchering yet. We hope to do a little of this for ourselves this year just to get a feel for it. Maybe next year we’ll offer some for sale. We are also very interested in breeding chickens for hatching eggs. We have to figure out how to keep them seperate in order to do this. We can’t keep the chickens we have in the pasture right now. They roam the yard, the garden and the surrounding fields at will right now. Once we figure out how to contain them, maybe we can work on breeding. Bit the dust. We have such a big demand for eggs. We had to have more room for chickens. So now the all the feed and equipment is in the garage instead of in the feed shed. Wow! There is a huge market for these out there! Hy-Vee in Macomb wants 60 dozen a week, Ducks in Nauvoo goes through 3-7 doz a week, we can sell 15 to 20 dozen a week at farmer’s markets and we have several people and offices that have expressed an interest in having eggs delivered. We’ve only just begun to tap the tip of this iceburg. Naturally, a great deal of our efforts are being focused here. We have ordered 125 more chicks to fill the feed shed with. Hair sheep are incredibly good mamas. It has been so cold and they are popping out babies with no problems. But the chickens are making us more money. 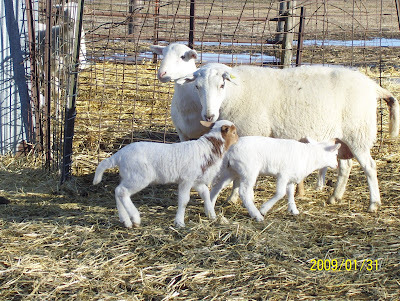 We plan to downsize the herd to only 4 or 5 ewes and a ram. Don’t have any at the moment, but Grampa would really love to have a milk cow or two. We have bought bottle calves to raise and sell for several years, but we’re not sure we’ll be able to do that this year. Chickens are going to be top priority! Grampa says he wants to be the chicken king of Hancock county first. To be truthful, I think he probably already is. There just aren’t many egg producers around here. We are working on our taxes. It is amazing, but we sold almost as many dollars worth of noodles as we did eggs last year. I’ve managed to start making some noodles for the markets this year. I could have sold more, but didn’t have the time to make them. My golden goose eggs and blown eggs were a hit. Not as big a hit as the noodles, but we’ll be doing this again. Haven’t seen Pinky for quite some time. She disappeared at the same time our mutt came home with a huge wound on his back. A couple of weeks later the cat came home with a very similar wound. We really loved this breed though. 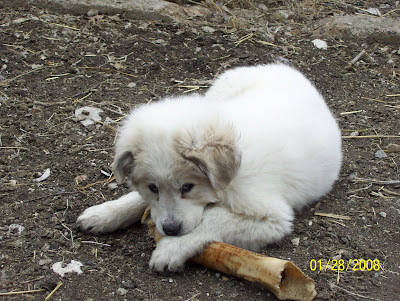 We would still like to breed these dogs, but we’ll have to wait for a while. 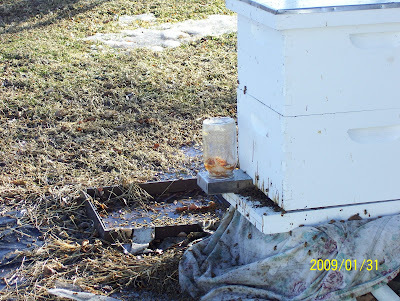 It is amazing, but we still have one hive alive after the ice storms. Grampa had a bad reaction after being stung several times. I won’t let him work the hives anymore. I’m not crazy about taking care of them myself. I’ll do what needs to be done to utilize the 4 hives we have, but this won’t be a big money maker for us. Have just started to push this. I’ve made the 30% level. I’d like to get to the Unit Leader minimum and then focus on recruiting. Fairly good year, considering the fact that the company that was supposed to spray the weeds was really late getting it done. We will be converting a couple of acres of it to sweet corn this year. Didn’t produce nearly enough! Trying to figure out how to do more this year. No income yet, but I haven’t given up hope. Just got to figure this one out. Remember, you can help me out by ordering your vitamins through the ad on the right column of my blog! 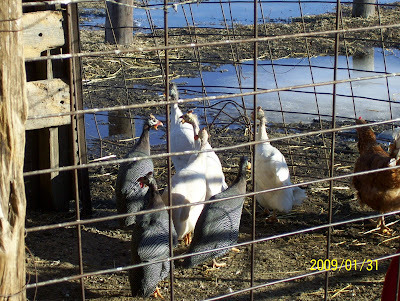 Here’s a picture of the latest species addition to our farm, guinea fowl. What are we going to do with them? I have no clue! They were given to us with a bunch of chickens. Ugh! I’ve had such a case of writer’s block when it comes to this blog! Grampa and I are currently exercising our immune systems. Seems we picked up some horrible flu bug. I can’t do much of anything so I thought I’d better at least post! We’ve been getting some frost here. My parsley really loves this weather and the cilantro is coming back nicely. If we were still going to the farmer’s markets I could sell some of it, but that’s about all we’d have to sell and even with the drop in gas prices it wouldn’t be enough to make it worth it. My October was spent finishing up my assessing job. Grampa spent it cleaning up around here waiting for it to stop raining so he could get in the fields. Normally, they are done with the harvest around here by now, but it’s been to wet! Oh well, he’s gotten a lot done around here. One thing I really like about him working at home is that our place gets a lot more of his attention! 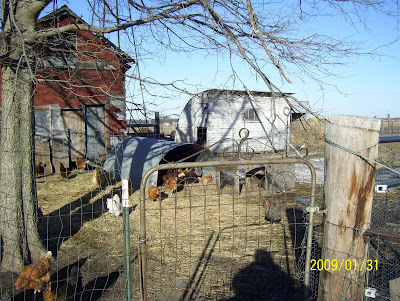 Then the first week in November we went to the small farm conference in Columbia, MO. We’ve gone down there for a day every year for a while now, but this year we decided to go for the full 3 days. We learned all about marketing, chicken breeds, sheep, honey, etc … as well as getting to meet so many people like ourselves. We may be crazy, but we’re not the only ones! Since then I’ve been putting up apples. We had a wonderful apple crop this year! A lot of it went to the sheep and chickens because I was to busy with the assessing, but I’ve made about 4 gal. of apple juice and 40 quarts of applesauce. I was planning to put most of it into apple juice but the juicer I snatched out of the garage sale gave up on me. I’ve got 7 more 5 gal. buckets to go. They will all be applesauce. That’s way too much applesauce for us, but my bees will like it. The standard practice in the honey industry is to harvest all the honey and feed the bees corn syrup over the winter, but we’re not real crazy about that. We decided to leave the honey this year and supplement only if we needed to. Then I was reading that bees liked rotting fruit. Then I saw a bunch of them on some apples on the ground. I decided to see if they’d like apple juice and they loved it. Since my juicer quit, I think I’ll put ½ applesauce and ½ water in the jars. They ought to like that. The chickens will love the treat when the bees get done with it too! Grampa is really enjoying this summer. He says it is going very fast. He told me he even enjoys all the hoeing he’s been doing. He says he may not be making as much money as he used to, but at least it’s his money and he’s not working to make someone else rich anymore. So far this year this has been a big disappointment. Between the wet, cold spring, the flooding and the gas prices we’ve not had near the business we’ve had in the past. I’m going to have to turn down donations for a while. I met a lady the other night who runs a similar business up near Burlington. Guess what it is called? Aunt Sue’s! She says her business has been way down this year too. We aren’t getting as much per dozen as we would like yet, but we have been able to move all the eggs we produce. We need to increase our production and are discussing ways to do that next year. We are also planning to get into breeding Welsummers next year. They are a rare breed of chicken that lays a very dark brown egg. They bring a pretty penny. We’ve seen hatching eggs go for $20 or more a dozen. The sheep are doing great. We’ve got to many for the amount of pasture we have, but Grampa wants to lamb them one more time before he downsizes. These sheep live up to all the things we’ve heard about them as far as heartiness and prolificness. Unless we get more pasture, this is one project that’s not going to grow. The cow and the two bottle calves we currently have are doing fine though. It’s amazing, but people are really buying my noodles. Given the right equipment I could probably add to the value of every egg we produce by 500% or better. However, that would require me to spend all day every day rolling out noodles. I enjoy it, but not that much! Still, it’s a good use for the “B” grade eggs we get. Pinky is growing beautifully. She’s also become quite the guard dog. She’s busy all night patrolling. I absolutely love this breed! They are so gentle and easy to train. 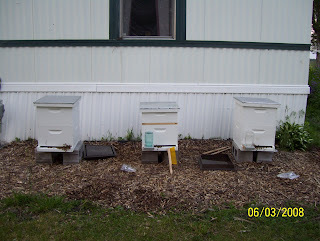 We started out with 2 hives and now have 4, two of which now have honey supers on them. It’s not terribly common to get much honey in the first year, but I think we’ll have enough for us anyhow. This is another “if I only had the time” project. I currently have 4 customers. It’s enough to keep me going with it. 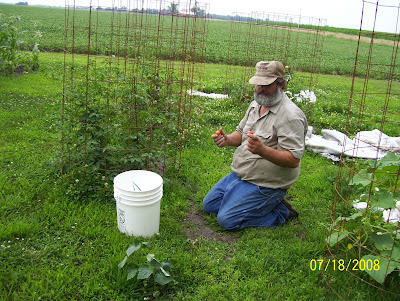 Had a horrible time getting CPS to come spray the beans this year. We’ll make money on them but not like we should. 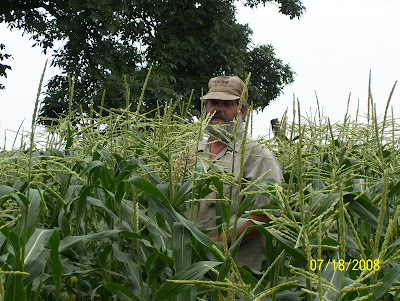 Next year we are going to plant a large portion of it in sweet corn. We NEED more garden space! Herbs are an especially hot item. 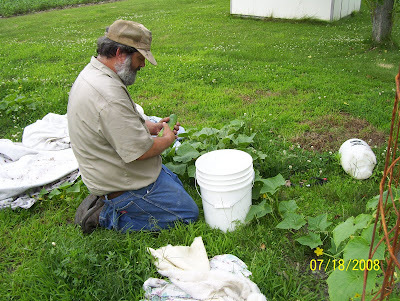 We’ll have corn, tomatoes and cucumbers next week. Everyone has been asking for these for weeks. No luck with this so far, but again, it’s not something I’ve worked at a whole lot either. If we make some money, fine, if not … Hey, it can’t hurt can it? Absolutely no time for this project this year! Maybe next year. Well folks, I am not keeping up well at all! Things have been so crazy for me lately! Luckily, my 8 y/o granddaughter has come for an extended visit. She got here a couple of days ago and has been a great help. Maybe, just maybe I’ll get caught up! Our bees swarmed today so tomorrow we need to go get another hive. That will make 4. Hopefully, we’ll get some honey this year. We do need to learn how to prevent swarming though. From what I understand they produce a lot more honey if you can keep them from swarming – but I suppose multiplying the hives this way is a good thing in the beginning! It’s late and I need to get to bed so I’m making this post short, but I wanted to show you the tractor I currently have on E-Bay. Grampa Tom bought himself a brand new John Deere tractor this spring so we are selling the old family Allis Chalmers. 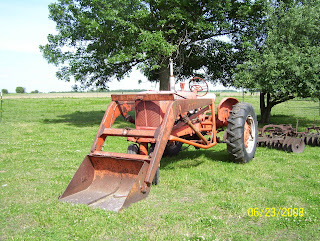 If you know anyone who collects antique tractors, please send them to my E-Bay site! Whoo! Hoo! I got my internet working again … at least for awhile. Grampa hit the satellite dish a while back and last week it slowed down so much that I couldn’t post. Today I went and hit it with a hammer and it is working better. I have to get a part replaced, but at least I don’t have to wait until next week to get on line anymore. Praise God! Anyway, we had an exciting thing happen last week! I was standing at the kitchen window when I heard a loud buzzzzzzz! 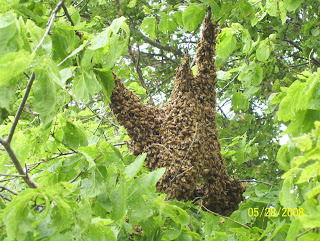 I looked out and saw a swarm of bees settling in the tree behind the house. We have 2 beehives so I thought one of ours had swarmed (not a good thing), so I called Grampa Tom and told him I thought we were losing our bees. 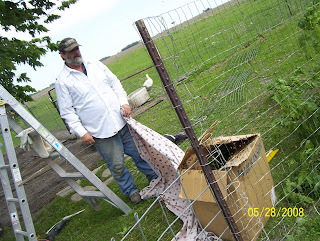 He came right home and checked out our hives.They were full of bees, so we proceeded to catch this new bunch of bees. 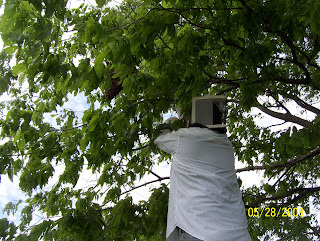 Here’s Grampa using a power saw to saw the branch the bees had settled on out of the tree. He said they started gathering on his arm as he was doing this. He thought he might just be able to carry them all down to the box we had for them. We put the branch in a cardboard box and waited a few minutes to let them settle down. 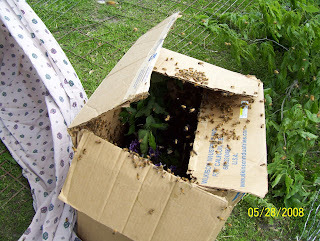 Then we put a sheet over the box and raced down to Daydants to buy a new hive for them to live in. 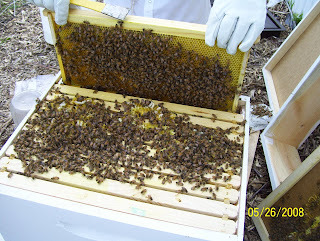 At dusk Grampa swept them into the new hive stocked with sugar water to help them feel at home. They seem to like their new home so now we have 3 hives instead of 2! We feel so blessed to have these bees choose us! Here’s a picture of the inside of a bee hive I had taken a few days earlier to show you.